For other people named John Anderson, see John Anderson (disambiguation). Not to be confused with Jon Anderson. John David Anderson (born December 13, 1954 in Apopka, Florida) is an American country musician with a successful career that has lasted more than 30 years. 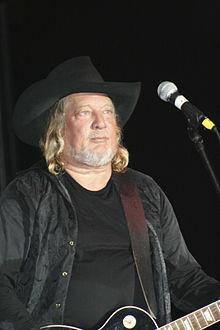 Starting in 1977 with the release of his first single, "I've Got a Feelin' (Somebody's Been Stealin')", Anderson has charted more than 40 singles on the Billboard country music charts, including five number ones: "Wild and Blue", "Swingin'", "Black Sheep", "Straight Tequila Night", and "Money in the Bank". He has also recorded 22 studio albums on several labels. His newest album, Goldmine, was released on May 26, 2015, on the Bayou Boys Music label. Anderson was inducted to the Nashville Songwriters Hall of Fame on October 5, 2014. Raised in Apopka, Florida, Anderson's first musical influences were not country artists, but rock and roll musicians such as Jimi Hendrix and The Rolling Stones. He played in a rock band until the age of 15, when he discovered the music of George Jones and Merle Haggard and turned to country music. Anderson moved to Nashville, Tennessee, in 1971, arriving unannounced at his sister's home, and took on odd jobs during the day - including one as a roofer at the Grand Ole Opry House - while playing in clubs during the evenings. The club appearances finally paid off in 1977 when he signed his first recording contract with Warner Bros. Records. He first hit the Billboard Country Hot 100 chart in 1977 with the song "I’ve Got a Feelin’ (Somebody's Been Stealin')", then broke into the country Top 40 with "The Girl At The End Of The Bar" the next year. Anderson's decidedly backwoods accent and distinctive vocal timbre helped land him in the forefront of the "New Traditionalist" movement with artists like Ricky Skaggs and George Strait. A steady stream of singles through the late 1970s and early 1980s continued to build Anderson's name in the country genre. The song "I'm Just an Old Chunk of Coal (But I'm Gonna Be a Diamond Someday)" from the 1981 album John Anderson 2 netted Anderson a Grammy Award nomination for Best Male Country Vocal Performance. The release of Anderson's fourth album, Wild & Blue, in 1982 led to his breakthrough to mainstream country when the single "Swingin'" hit the airwaves early the next year. Co-written with long-time writing partner, Lionel Delmore, the song broke into the country charts and reached Number One by March, while at the same time crossing over to the Billboard Hot 100, reaching a peak of Number 43. The single became the biggest selling record in the history of Warner Bros. Records. In the wake of "Swingin'", Anderson received five nominations for Country Music Association awards for the year. He was the winner of the Horizon Award, and the song was named Single of the Year; he also received nominations for Song of the Year, Male Vocalist of the Year, and Album of the Year. Anderson's success with Wild & Blue carried on through several more albums, but none would match its chart numbers or sales. In 1986, Anderson and Warner Bros. parted ways. After leaving Warner Bros., Anderson signed with MCA Records and released two albums under that label, followed by one with Capitol Records in 1990. Chart success was minimal throughout those years. However, that turned around in 1991 when Anderson joined BNA Records and, working with legendary country producer James Stroud, released the album Seminole Wind. Powered by the title single, which rose to Number Two, and the Number One single "Straight Tequila Night", the album proved a resurgence for Anderson's career. The album has been certified two times platinum, the highest of any of Anderson's albums, and he was nominated for three CMA Awards - Male Vocalist, Song of the Year and Album of the Year. The success of Seminole Wind brought a fresh life to Anderson's career, and he released a number of albums that charted well, producing several more singles that pushed to the upper levels of the country charts. The 1993 album Solid Ground produced a Number One single, "Money in the Bank", which turned out to be the most recent chart-topper of Anderson's career. He recorded for BNA through 1996 before leaving the label. In 1993, Anderson was awarded the Academy of Country Music Career Achievement award. Anderson has recorded for several labels since his departure from BNA, with moderate chart success. A new album titled Bigger Hands, a return to working with Stroud as producer, was released in June 2009. Over his career, Anderson has collaborated with a number of different artists. He has worked with John Rich of Big & Rich on his 2007 album Easy Money, and co-wrote Rich's 2009 single "Shuttin' Detroit Down" He has been named an honorary member of the MuzikMafia, of which Rich is also a member. Anderson lives in Smithville, Tennessee, his home for more than 30 years. ^ a b c Huey, Steve. "John Anderson biography". Allmusic. Retrieved 2009-05-18. ^ a b c "John Anderson bio". cmt.com. Retrieved 2009-05-08. ^  Archived 2014-10-24 at the Wayback Machine, nashvillesongwritersfoundation.com, October 6, 2014; accessed January 3, 2015. ^ a b c "John Anderson is Takin' the Country Back... And Who Is Better Qualified". cmt.com. July 29, 1997. Retrieved 2009-05-08. ^ a b "John Anderson bio". Billboard.com. Retrieved 2009-05-08. ^ "John Anderson 2". johnanderson.com. Archived from the original on 2009-04-01. Retrieved 2009-05-08. ^ a b "CMA Awards: John Anderson". cmaawards.com. Retrieved 2009-05-08. ^ "Heartland". UPI.com. December 6, 2002. Retrieved 2009-05-09. ^ "John Anderson awards". CMT.com. Retrieved 2009-05-09. ^ "John Anderson Plans New Album With James Stroud". CMT News. CMT.com. April 10, 2009. Retrieved 2009-05-09. ^ a b "Yahoo News". Yahoo Music. April 9, 2007. Archived from the original on January 5, 2013. Retrieved 2009-05-09. ^ "John Rich: Nation's Financial Crisis Inspired "Shuttin' Detroit Down"". CMT.com. April 1, 2009. Retrieved 2009-05-09. ^ "MuzikMafia members". Retrieved 2009-05-09.